It now seems to be a truth universally acknowledged that social media is bad—bad for our well-being and privacy, too much of a time-sink, and so on. But does it have to be? Can it be made good? Or, slightly less bad? Shaking up who you follow and share with can do wonders for your social media life, and here’s how to go about it. Imagine opening up Facebook, say, and seeing posts from people you’re actually interested in hearing from, rather than a dated meme from the partner of someone you once met on holiday in 2015. Or posting a photo to Instagram without worrying that your boss or your grandparents will see it. Here are some pointers that might help clean up your social media landscape. 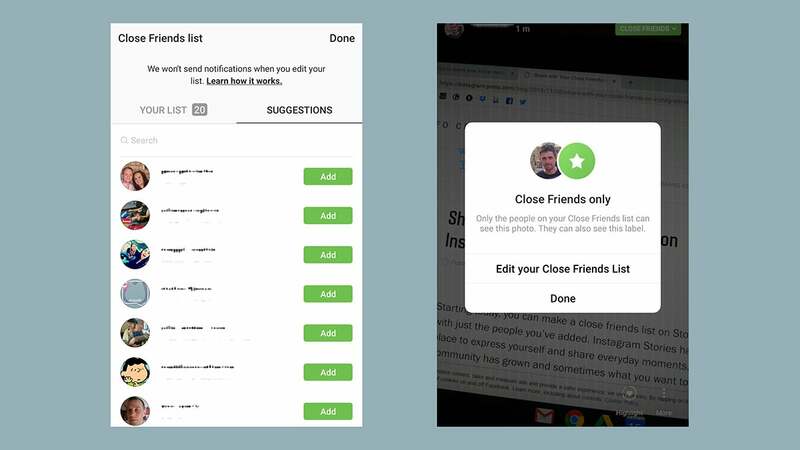 Instagram just introduced a Close Friends feature so you can create a list of people your comfortable with seeing everything you post on Instagram, versus those you are not (employers, family, random person from that pub crawl last year). Now you’ve got two Stories: Your main Story, and your Close Friends Story. 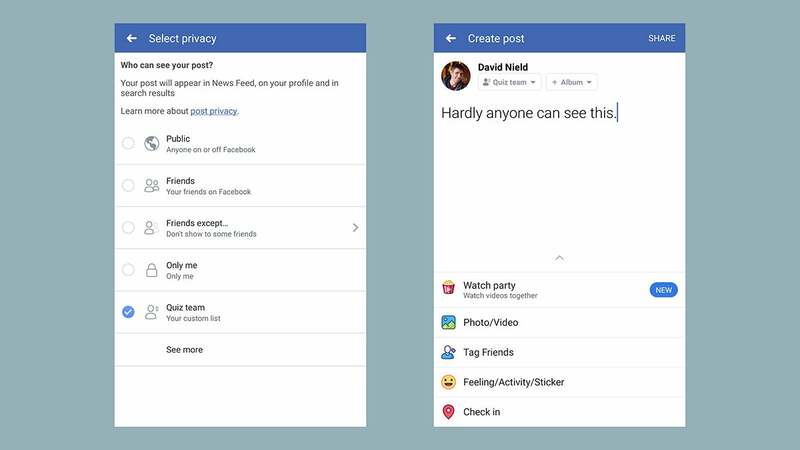 The next time you’re doing something shareable, you’ve got the choice of which one is most appropriate—and of course only you can see your Close Friends list. Tap and hold on your Story bubble then pick Edit Close Friends List to start the judging process. The next time you share something as a Story, you can pick Your Story or Close Friends at the bottom. This kind of selective sharing has actually been in Instagram for a while. From your profile page, tap the menu button (top right), then Settings and Story controls, and you can block specific people from seeing any of your Stories—Close Friends or otherwise. The audience for photos and videos posted to your feed can’t be limited in the same way, though you can make your account private so that your Instagram posts aren’t visible to the world at large. That’s sharing, but when it comes to the clutter in your feed you can tap the three dots by any post to unfollow someone (never hear from them again) or just mute them (the same thing really, only they won’t know you’ve disconnected from them)—maybe you want to still direct message someone but hate their inane posts. There’s also the traditional approach of tapping Following on your profile then browsing through the list and unfollowing anyone you’ve grown bored of or annoyed by. Set aside ten minutes for the job and your Instagram feed will thank you for it. Facebook has long offered a host of tricks and tools for managing your sharing and following count, they’re just not used very often. It’s worth taking a few minutes to dig into them though, as it can make the whole idea of posting or browsing much more appealing. Whenever you post something on Facebook there’s actually an audience selector button just underneath—it’ll usually say Friends, the default. Tap this and you can block some friends from seeing the post or pick a custom list of contacts, like work colleagues, or best friends, or everyone except your uncle. Custom lists need to be set up on the web but are available from wherever you post, whether phone or tablet or browser. You can pick them when you’re sharing to your Facebook Story too, if you use the feature. What custom lists also once gave you were tailored news feeds with only a few people on them. Unfortunately, Facebook is shutting down this feature to keep everyone on the main news feed, which is a shame. Friends lists are staying, but you can’t use them as alternative news feeds any longer. 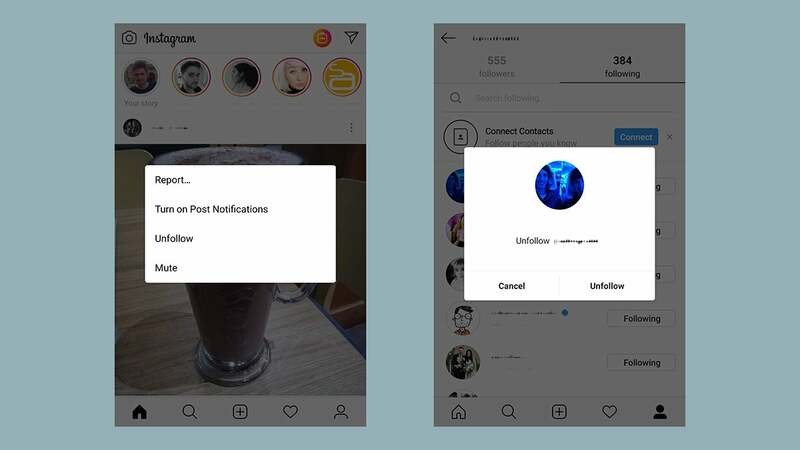 Instead, you need to turn to those three little dots at the top of every post in your feed, which give you the power to unfollow people (stay friends but hide all their posts), mute people for 30 days, or hide certain types of advert. To unfriend someone completely, you need to tap through to their profile and tap Friends. 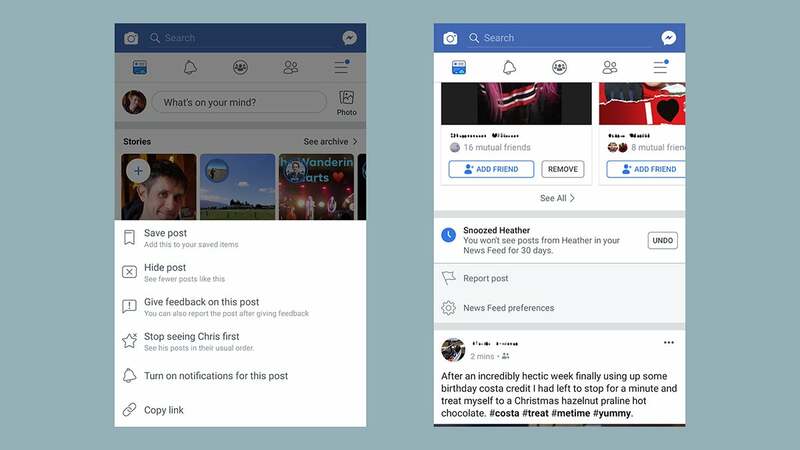 Even just hiding or muting a few people every time you open up Facebook can do wonders for the mix of your news feed—you don’t have to spend hours on the task—provided the people you actually want to hear from are still posting on Facebook, of course. 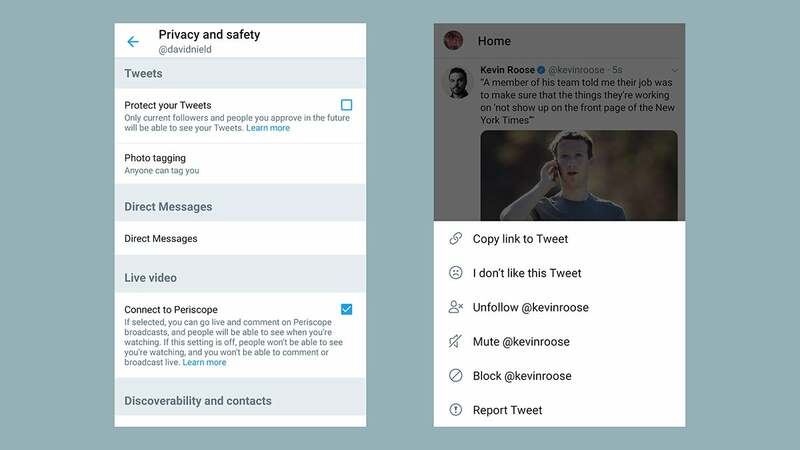 When it comes to sharing on Twitter, you’re either going public with all your tweets or you’re staying private with all your tweets—so only an approved list of followers can see them, and they can’t be retweeted. You can switch between public and private from the Settings screen (tap your avatar, Settings and privacy, Privacy and safety). With that in mind Twitter isn’t really the best of the social networks for granular control over what you’re sharing and to whom, and it’s so far resisted the temptation to tack on a Stories component too. Direct messaging is one option if you want to share something with a select group of people. On the other hand, you do get plenty of flexibility when it comes to tailoring your Twitter feed and picking which tweets and accounts are visible. Tap the downward arrow next to any tweet and you have the option to unfollow the tweeter (break the connection entirely) or just mute them (stay connected but without seeing any of their posts). Then there are Twitter lists, which can be really useful if you put a little time and effort into them. 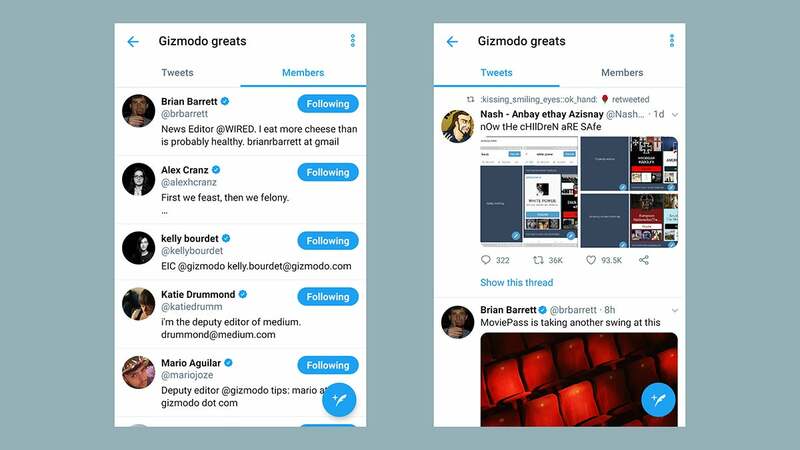 Tap your avatar then pick Lists to make or edit a list—note they’ll be public on your profile, and people will know they’ve been added to them, unless you make them private—picking out Twitter users and accounts you want to include. Note you also have to go to specific profiles to add someone to a list (tap the three dots, top right). It could be work colleagues, accounts based on a particular topic, or just the tweeters you find most entertaining—you don’t even have to follow someone to add them to a list. You can then load up the list as an alternative to your main Twitter feed whenever you need a break from the deluge... you can even bookmark them on the web. Finally a shout out to TweetDeck, which lets you set up lists as columns separate to your main feed, complete with keyword filters if you need them. If you want to shrink down your Twitter circle without actually doing any unfollowing, it’s ideal. And so to Snapchat, which may struggle to attract users over the age of 18, but actually gets a lot of social sharing right (which is maybe why Instagram spends so much time copying it). Tap your avatar, then the cog icon, then View My Story to change who can...view your story. Stories can be made public or kept to your friends, and you can block certain individuals from viewing the feed too. 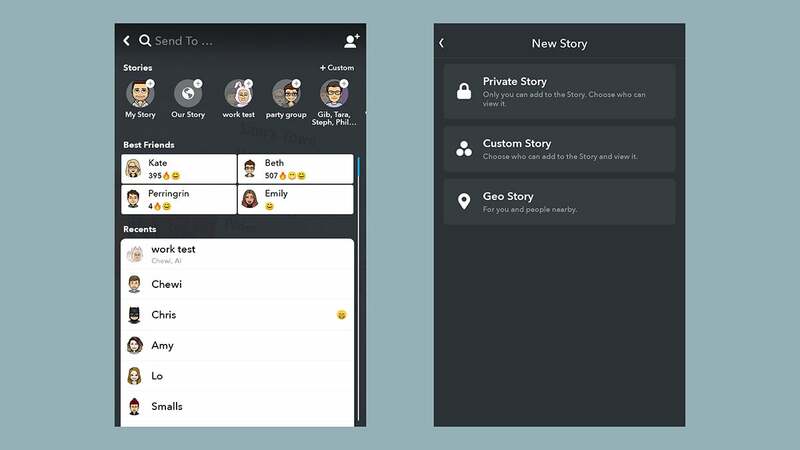 You can set up specific Stories for specific people as well. Snap something, hit the send button, then choose Custom next to Stories: Pick out a group of people (best friends, school friends, Snapchat influencers, whatever), and only they can see the Story you share, with the custom name you give it. Anyone included can share to the new Story group as well, if they want. The Story group stays until you delete it, so you can keep sharing snippets that last 24 hours to a certain collection of people. This is different to just sending ordinary Snapchats to a group, which disappear as soon as they’re opened—Snapchat was built around the idea of more personal sharing, so it’s no surprise you’ve got lots of options. There aren’t as many choices for controlling what appears in your Story feed though. Perhaps because it’s not so much the main focus of the app. 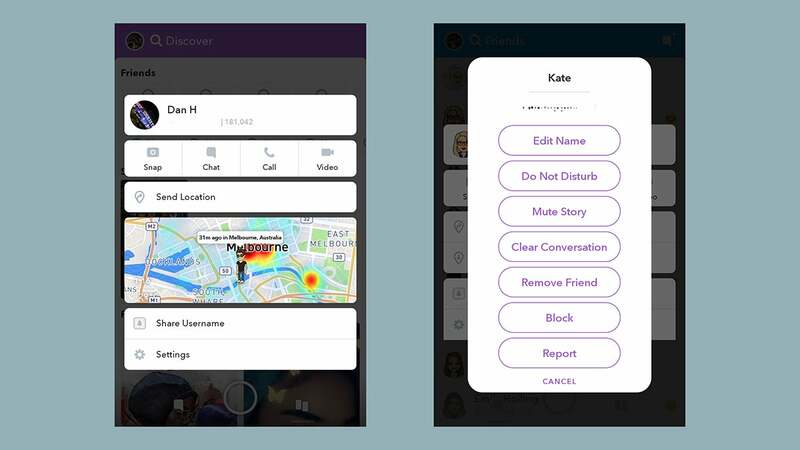 With a long press on a name in the friends list and a tap on Settings you can either remove the person as a friend, or choose to Mute Story—their 24-hour Story snaps won’t then show up on the Discover page. You can also long press on a name on the Discover page to get to the same Settings option. If you don’t want to hear from someone at all—direct Snaps or Stories—choose Do Not Disturb. Any photos they send you will still be delivered, but won’t prompt a notification on your phone. As usual, no one will be able to tell if you’ve muted their Stories or put them in Do Not Disturb mode, so it’s a way of easing the pressure of keeping up with your most prolific Snapchat friends, without actually banishing them for good.